The GMO agritech sector and food companies have spent tens of millions of dollars in the US to prevent the labelling of foods containing genetically modified organisms (GMOs). 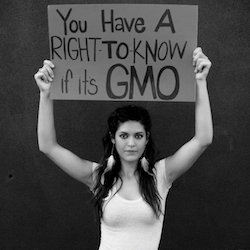 The public have genuine concerns about GM but are being denied the right to know if GMOs are in the food they eat. And the concerns they have are valid. There is sufficient evidence that indicates the adverse health impacts of genetically engineered food and its associated input, glyphosate, which a major World Health Organization report states is “probably carcinogenic to humans. » The majority of GM crops are modified to withstand unlimited doses of glyphosate. The main GM crops – corn, canola, soy and sugar beets – end up in 70 per cent of processed foods in North America. Over the past few years, the Canada-based Kids Right To Know (KRTK) group has been campaigning for the mandatory labelling of GMOs in food products. Consumers have a right to know what is in their food and the processes or substances involved in producing it that could have health-damaging consequences. On 30 June, Rachel Parent (founder of KRTK) met with Canada’s new Minister of Health Dr. Jane Philpott to discuss GMOs and labelling. She was joined by Steven Druker, author of ‘Altered Genes. Twisted Truth’, as well as Aube Giroux, a documentary film maker. Parent explained to the minister that the vast majority of Canadians want mandatory GMO labelling and presented her with an extensive list of international organizations that support GMO labelling, including the Ontario Public Health Association, Canadian Association of Physicians for the Environment, American Nurses Association and the British Medical Association. The minister was given a document containing 10 published, peer-reviewed studies that raise serious concerns about the health risks of GMOs. Another document signed by 300 independent scientific researchers who advise that there is no scientific consensus on GMO safety was presented, along with a further document of 126 international health and public interest organizations that believe that GMOs have not been proven safe. She also received a copy of the 2015 WHO report that declared glyphosate to be a probable carcinogen to humans, the active ingredient in Roundup herbicide, which in sprayed on about 85 per cent of genetically modified crops. Steven Druker and Aube Giroux then presented the minister with a copy of the Royal Society of Canada report that was commissioned by Health Canada (the federal department responsible for helping Canadians maintain and improve their health) in 2001. Some 15 years on, 51 of the 53 recommendations in the report have not been implemented, including recommendations about independent testing and transparency. It might seem reasonable to require any testing of GMOs for health safety to be done exclusively by the public sector and government institutions – free from outside pressures – and to ensure a fool-proof regulatory regime predicated on sound independent research and verification of claims open to public scrutiny. It’s the least we could expect considering that GM has the potential to irreversibly alter the genetic core of the food supply. Despite this, in a 2015 meeting with two senior officials from Health Canada, Parent was informed that the agency does not carry out its own safety studies on GMOs: it merely reviews the data given to it by the industry and approves GM foods based on non-peer-reviewed industry-submitted information. One of the officials stated, “It’s up to them [the industry] to demonstrate the safety. » She was told that because some of the data is proprietary data, Health Canada is not going to divulge information to anyone else to test the product. Apparently, Health Canada’s toxicologist didn’t agree with the techniques used and therefore couldn’t draw any new conclusions or questions about GMOs. So that was the end of it. Minister Philpott argues that mandatory labelling is usually based on safety concerns and regulations, thus implying GMOs are safe to consume. During the recent meeting, however, in addition to the evidence presented by Parent, Steven Druker went on to explain to the minister that there is solid evidence to prove that GMOs in fact do have many health risks associated with them. After the meeting, Parent met with MP Pierre-Luc Dusseault who is introducing Bill C-291 for mandatory GMO labelling in Canada, which is expected to have its first reading in December. The next day, she was in Montpelier, Vermont, to celebrate their GMO labelling law that had just come into effect. While Vermont’s Governor Shumlin spoke about the importance of the new labelling law, Bernie Sanders gave an impassioned speech and warned of the revised DARK Act that would overturn Vermont’s democratically achieved state labelling law. The Dark (Deny Americans the Right to Know) Act is a piece of anti-consumer, pro-industry GMO ‘labelling’ legislation that carries no penalties if not complied with and uses a code to denote genetically modified ingredients that requires a smart phone to decipher. It is intended to obscure the fact that a product has undergone genetic modification and is a cynical tactic designed to preempt state and local authority attempts to label and regulate GM foods. According to Rachel Parent, public officials should be looking for conclusive proof that GMOs are safe. Instead, they appear to want conclusive proof that GMOs are not safe, and, until that evidence is in, GMOs can stay on the market without proper labels. Perhaps such officials may also wish to consider that GM ingredients should not even be on the commercial market in the first place, since, according to the evidence presented in Steven Druker’s book, the industry subverted science, corrupted government and deceived the public in order to put them there. Parent concludes that nobody wants to take on the responsibility of making GMO labelling mandatory in Canada, despite the fact that over 60 countries around the world have this law already and polls show that about 90 per cent of Canadians want this to happen. At the very least, mandatory labelling should be a no-brainer. Why flood the market with GMOs and just hope for the best – when the evidence indicates we should expect the worst?